Appetizing vegetarian food at the best restaurant in Delhi! Suruchi is a contemporary vegetarian restaurant brand and a perfect destination for all day dining and entertaining, breakfast, lunch and dinner in Delhi. Our restaurant is an ideal place for a wide range of events ranging from formal dinners to get-togethers, premium parties to birthday celebrations etc. Suruchi Restaurant offers a fantastic dining experience in the soothing ambience of the restaurant that is known for its exceptional interiors and beautiful appearance. Over the years, the restaurant has grown into casual, family-oriented and a fine dining restaurant in NCR. We offer wholesome dishes that are cooked with right herbs, spices, flavours and textures to offer guests a broad and savory tasting of Indian cuisines. 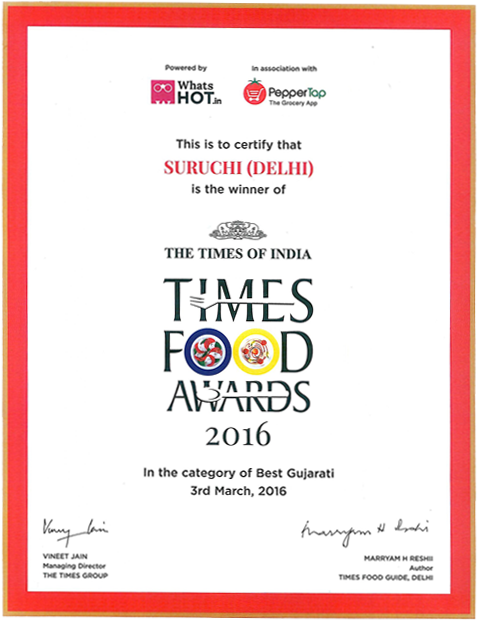 For serving superior quality food at fair prices, Suruchi Restaurant is reckoned among the best vegetarian restaurants in Delhi. To cook delicious vegetarian food, Suruchi has some of the finest and experienced chefs. Our passion and desire to continuously serve something unique and delectable has helped us to carve a niche for ourselves in this domain. Suruchi presents a glimpse of Indian tradition and culture with its delicious dishes. Right from the entrance to the dine place, this pure vegetarian restaurant in Delhi lets its guests to experience a king's lifestyle. Suruchi Restaurant look forward to bring its innovative menus and award winning beverages to new communities while continuing to craft memories with its amazing team members and guests. "Perfect place, perfect food and perfect service" are the synonyms to Suruchi Restaurant.